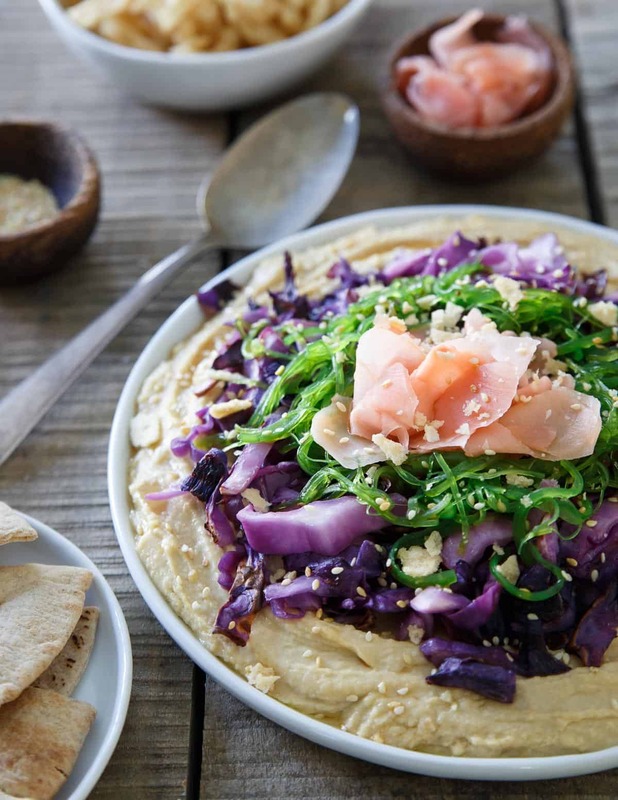 This Asian hummus platter topped with sesame cabbage, seaweed salad and pickled ginger is one tasty way to amp up your appetizer game. If you pulled up our driveway right now you’d see a rusted out dump truck, another rusted out, off-roading outfitted 1996 Tacoma (with mice living in the exhaust), stacks of split wood, logs waiting to be split and tarps covering said wood piles. We are totally living the red neck dream right now and yesterday proved it even more. I pulled up the driveway from the gym around 1pm yesterday afternoon to Ulysses outside with a chainsaw waving at me to not drive up any further and park the car at the bottom of the driveway. Um, ok? 5 minutes later, after hauling my gym bag up our ski slope of a driveway and approaching the situation, I realized something was off. He’s standing there hand on hip staring at the tree he’s half cut through the trunk of in silence. 45 minutes later and a whole lot of luck that the tree somehow didn’t fall on it’s own. A 100 foot rope is secured, tied around the tree on one end, to the rusted out Tacoma on the other end and he’s now driving the pickup across our front yard in hopes to pull the tree the other way. By some miracle, this whole thing actually worked and this stupid tree (with it’s 5 million tiny branches that went everywhere on our yard) finally came down in the right direction. 2 hours later of chainsawing, dragging branches into the woods and transporting wood from one spot to another, clean up was complete and I decided to go inside to start dinner. Not 5 minutes after the chainsaw was put away though do I hear the dirt bike (another element of redneck-ville I forgot to mention) starting up in the garage. Before I can walk to the front door to see what he’s doing with that, I see him wheely-ing up the driveway and using the tree stump as a “jump” while the dog chases him like a lunatic around the yard. That’s when the can of hard cider got cracked open and the container of hummus came out. I call it the adult version of “pre-gaming”. Sabra is calling it “The Unofficial Meal”. Call it whatever you like, but sometimes the best part of dinner is snacking while you’re making it. I do this all the time and usually it’s my favorite container of Sabra hummus, some baby carrots and crackers but today I decided to amp up the unofficial meal with some quick and easy Asian toppings. 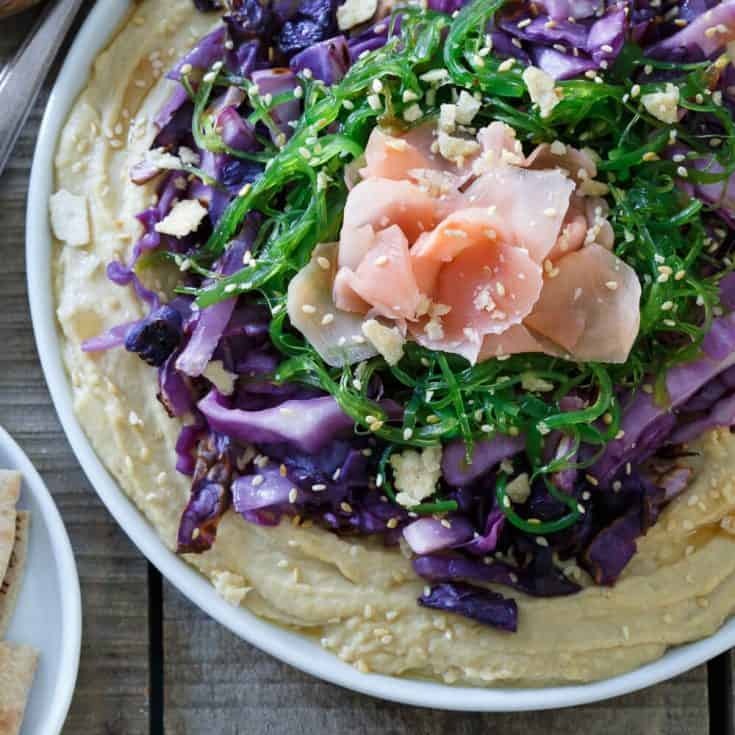 Quick sesame sautéed cabbage, seaweed salad (which is such a great pop of healthy greenery to have on hand) and some pickled ginger make for a delicious way to dip your way right into the main meal. And forget that the neighbors probably think you’re absolutely nuts. Place sesame oil in a skillet over medium heat. Once hot, add cabbage and saute until softened, about 5 minutes. Season with salt and pepper to taste. 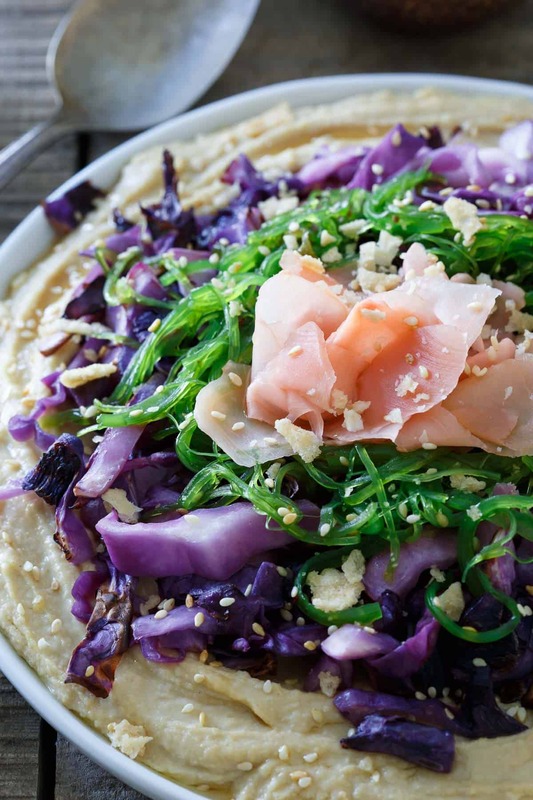 Place sauteed cabbage on top of hummus, top with seaweed salad and pickled ginger. Garnish with sesame seeds, sesame oil and crushed crispy wonton strips. Serve with toasted pita chips. *This post is sponsored by Sabra. All content and opinions are my own. Your story is so recognizable: only in my story it’s not my boyfriend chopping the wood but my dad! And he’s stubborn, too. Aaanyway, I came here to check out the recipe and I’m glad I did. I looove hummus in any way and yours looks really tasty! Will have to make this some time, so pinned! Yum. This looks delicious — perfect for an appetizer. And OMG, so glad the tree came down away from the woodshed! LOL. Sounds like you’re living my husband’s dream! Let the boys be boys, I guess. Oh man, if someone asked my husband to go chop down a big tree, I don’t think he would even know where to begin! Love that your husband was doing wheelies afterwards. This hummus looks so good, Gina! I can totally see this happening to my husband, especially the staring at me in silence thinking all the bad thoughts! 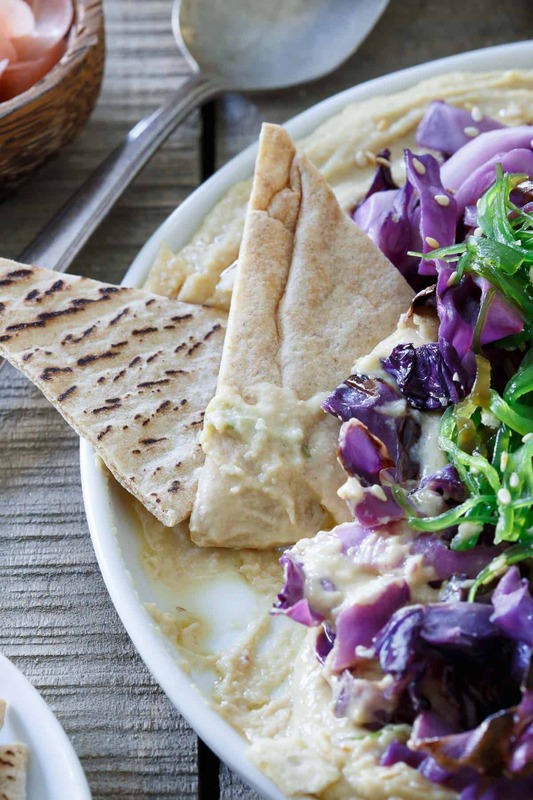 ;-) So I’m loving the Asian toppings on this hummus especially the pickled ginger! I’m the girl who sits there eating all of that after her sushi like it’s dessert. That is so funny! This sounds like the cliche husband and wife life. HEHE! Hahaha. Fun times you’re having. :D And I love how you transformed regular hummus into something a bit different. I didn’t even know pickled ginger was a thing. Off to check that out! I’ve honestly never thought of giving hummus an Asian twist, but this looks and sounds incredible. I can’t wait to give it a try. Such a fun and easy appetizer for summer! Wow, Asian cuisine and hummus NEVER EVER popped into my own mind as a recipe. This is literally revolutionary! 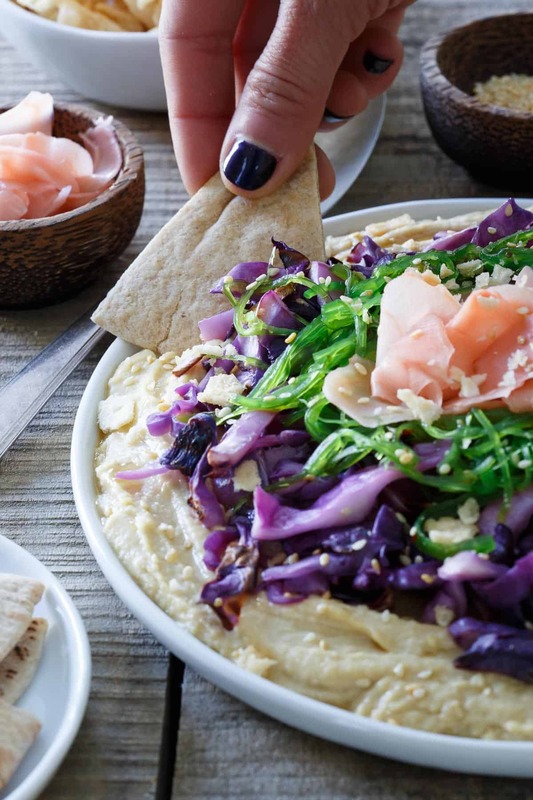 I think Asian-topped hummus is such a clever idea!